Amid a rough MLS season, with murmurs of ownership maneuvering and a new stadium on the horizon, D.C. United has embarked on a bold and necessary summer makeover. D.C. United on Wednesday afternoon appeared to answer any lingering questions about its commitment to the remainder of the 2017 season and its intentions for next year—when it plans to open its long-awaited new stadium—as it worked to seal a dramatic summer overhaul with the signing of U.S. national team midfielder Paul Arriola. The looming acquisition will require the largest transfer fee of around $3.5 million, the largest in club history, a source confirmed to SI.com. The move was reported first by The Washington Post. Arriola, 22, was on his way to the nation’s capital Wednesday afternoon and could be unveiled as early as Thursday, SI.com understands. Some paperwork and details of the transaction still needed to be finalized, according to another source, and the transfer window closes Wednesday night. Once that’s done, Arriola will join at least three other newcomers on a United side desperate for an infusion of energy and quality. Performances have been poor this year—DCU is 5-14-4 and seven points behind the next-to-last side in MLS’s Eastern Conference—but of equal concern was the club’s image and trajectory heading into 2018. There’s been some uncertainty in Washington surrounding ownership’s short- and long-term priorities and plans. But there’s no question now that the effort and investment, at least, is there. Arriola is a young, promising American international expected to pay quick dividends on the field and perhaps down the road on the transfer market. That doesn’t come cheaply, and Tijuana apparently wasn’t eager to part with a player who was a frequent starter in the spring. The signings represents a historically bold move by D.C.
Arriola left the LA Galaxy academy for Tijuana following the 2012 MLS season and made his debut for the Liga MX club the following summer. He was a regular for the U.S. U-20 team and finally made his senior international debut under Jurgen Klinsmann in May 2016. 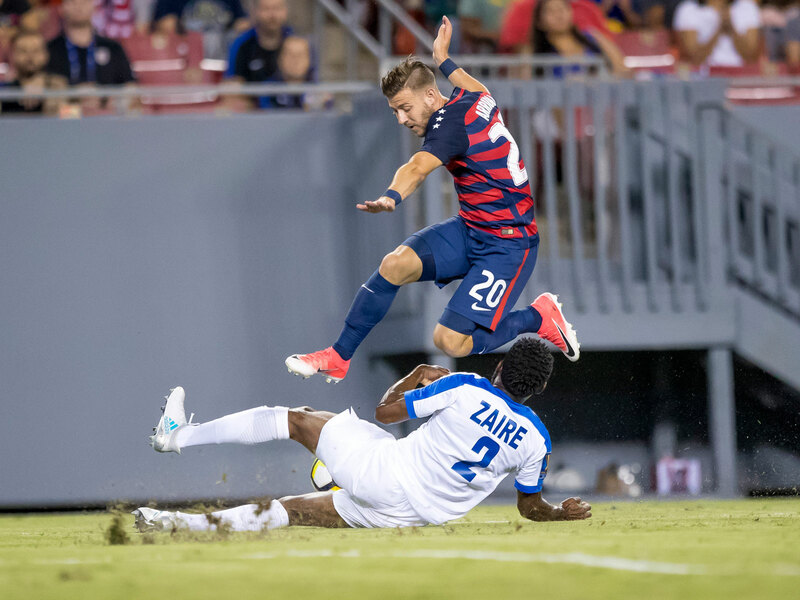 Arriola then played a significant role in the Americans’ run to the 2017 Gold Cup title, starting all three knockout round matches on the right side of Bruce Arena’s 4-4-2. Despite his national team status, Arriola isn’t named on MLS’s Allocation Ranking List, meaning DCU’s access to the player wasn’t subject to the allocation order. It was unclear Wednesday whether the Galaxy had homegrown player rights to Arriola and if so, how United acquired them. Arriola will join a team in transition, but one that finally appears to be heading in a promising direction. Even if United can’t make the up the 13 points separating it from a fourth straight playoff berth, it’ll head into its new stadium next year with some intriguing new faces. On Wednesday, DCU also was working to finalize the signing of midfielder Russell Canouse, who would arrive on a free transfer from Germany’s TSG Hoffenheim. Canouse, 22, played for the same PA Classics club that produced Christian Pulisic before he joined the New York Red Bulls academy in 2009. The defensive midfielder spent 2016-17 on loan with 2. Bundesliga team VfL Bochum. He trained with D.C. on Wednesday. Earlier Wednesday, United announced the expected addition of Hungarian attacking midfielder Zoltán Stieber, a left-sided attacker who represented his native country at last year’s European Championship. The 28-year-old arrives from FC Kaiserslautern, his seventh German club. United also added 19-year-old forward Bruno Miranda–a Bolivian forward who was last with Universidad de Chile–and Jamaican striker Deshorn Brown, who was acquired in June. The club's roster shuffle has also included the offloading of veteran defender Bobby Boswell and attacker Lamar Neagle. The biggest move is now imminent, meaning United—which already was starting to build around a young core of Luciano Acosta, Ian Harkes, captain Steve Birnbaum and Kofi Opare—suddenly has become a team to watch.